Xenophon (approximately 434 BC to 355 BC) was a Greek soldier and an historian. He was born in Athens to a noble family and studied under Socrates. In 401 B.C. he went to war with the intention to seize the Persian throne. 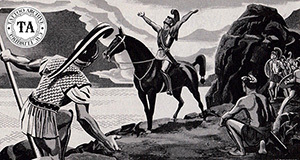 The war went wrong, all the commanders were killed and Xenophon as chosen as leader. He and the "ten thousand adventurers " retreated out of danger, living to fight the Persians again. Greek history tells us that on Xenophon's last campaign he captured a wealthy Persian and held him for an enormous ransom. This made Xenophon financially independent and he was able to retire from fighting. He spent the rest of his life writing. His works include the Hellenica, a history of Greece and Memorabilia, recollections of Socrates. In the history of Greece, Xenophon recorded that, "the sons of rich Mossunoikoi had their backs decorated and the front of their bodies tattooed in color."